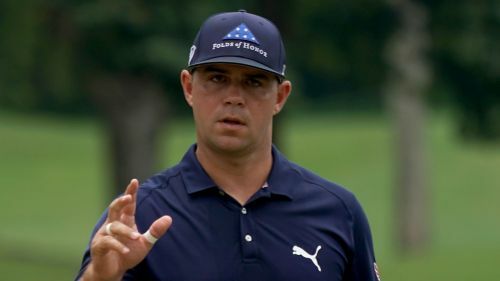 Gary Woodland tied the course record to take a share of the lead with Marc Leishman at the halfway mark of the CIMB Classic. Woodland came into his own on the TPC Kuala Lumpur West course on Friday, carding a magnificent 11-under 61 in his second round to match a record Justin Thomas set when he claimed the title three years ago. There were 11 birdies from Woodland, who is eyeing a first victory since claiming his third PGA Tour title at the Phoenix Open in February. The world number 38, a runner-up in this tournament in 2013 and 2014, said: "It's nice to stay aggressive out there. This golf course suits up pretty good for me; I've had success here in the past. It's nice to be back and playing well." Leishman will also start moving day on 14 under following a blemish-free 10-under second round. The Australian is yet to claim a victory in 2018, but has a great opportunity to secure a fourth PGA Tour title this weekend. Paul Casey and Shubhankar Sharma are just a shot behind the joint-leaders following rounds of 65 and 64 respectively, while Austin Cook and Bronson Burgoon - leader after the first round - are another stroke back. Two-time champion Justin Thomas is back on nine under following a 69, which included just the three birdies but no dropped shots.